In recent years, Dubai has cemented itself as one of the most significant cities in the world. Home to the world's tallest building, the Burj Khalifa, along with many other iconic skyscrapers, landmarks, and points of interest, this United Arab Emirates coastal city is well-known for its luxury resorts, amazing shopping locations, and vibrant night life scene. Strongly syonymous with big brands and upscale boutiques, Dubai has developed a solid reputation as a leading cultural and fashion city in the Persian Gulf and is an exceptional place to visit, with the city being amazingly clean, modern, and exciting at all times of day and night. The Dubai Mall and Palm Jumeirah Boardwalk are just a couple of things you can enjoy in this amazing location, but to really make the most of your trip to Dubai, you need to be as prepared as possible. One of the main reasons people visit Dubai is to go shopping and spend some cash, but you need to be aware of the local currency in Dubai and how many works in general in the United Arab Emirates in order to make the most of your trip. 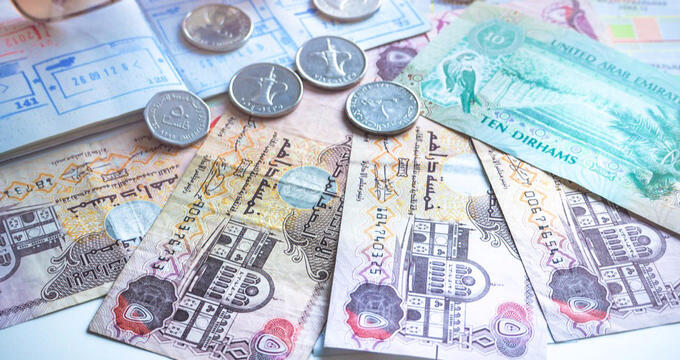 Just like any other country, the UAE has its own currency and money system, so it pays to know all about it before you arrive. Read on to learn all about the official currency of Dubai and check out some key facts on spending money in the UAE. The official currency of Dubai is the United Arab Emirates dirham. The official code for the United Arab Emirates dirham is AED and you may also see this currency referred to as the Emirati dirham. The symbol for the dirham is ?.? and one dirham is made up of 100 fils. The value of an individual Emirati dirham will vary over time just like any other currency, as there is no fixed rate for the AED. As a rough guide, a single United States dollar is usually worth between 3 and 4 dirham, but for more detailed and up to date valuations on the dirham, check out live currency tables. The 5 fils and 10 fils coins do still exist but are very rarely used or seen. There was once a 1 fils coin also, but this has been discontinued. The coins are made from bronze and cupronickel, decorated with various symbols and Arabic text. The larger and heavier dirham coins have larger values. The 1,000 dirhams note is rarely used, but the others are all seen quite often. Each note has its own color, with the 10 dirhams note being green, for example, and the 100 dirhams note being pink. The notes also become larger in size as their monetary value increases. The notes are decorated with Arabic text and numerals, as well as various images of locations and symbols associated with the United Arab Emirates like the Dubai World Trade Centre building, the Jumeirah Mosque, and the Qasr al-Hosn. Using a credit card or debit card in Dubai is strongly encouraged for travelers. It's one of the safest and smartest ways to pay, and Dubai in particular is a very modern city in a lot of ways, so you'll find card readers in all the shops and restaurants. In fact, you never really need to worry about having cash on hand at all, except for taxi fares, tips, or trips to the markets. However, travelers should always be aware of the rules and possible hidden charges that come along with using their cards. Many banks charge fees of around 1-3% on transactions made in foreign countries, so you can end up paying over the odds if you choose to use your card for lots of different purchases while on vacation. Speak with your bank to learn more. It's not impossible to use US dollars in Dubai, but it is discouraged. There are some hotels and stores that will accept American money, but the conversion rates can be astronomic and you'll most likely end up paying a lot more than you should be. -Check out multiple sources and conversion rates to get the best deals. A slightly different rate might not seem like much at first glance, but even a tiny decimal point of difference can translate to big bucks if you plan on taking a lot of spending money. -Plan out how much money you’re going to spend and how often you’re going to be using your card. If you need to make lots of little purchases each day and will be charged every single time by your bank, choose cash instead. -Keep a little cash on you at all times, just for those moments where you might need to leave a tip or pay for something without your card. -Shopping malls are good places to exchange money in Dubai, with several banks and cash counters located in locations like the Dubai Mall.